VANCOUVER — During the Christmas season, many people gather to spend time together and share memories of the past. 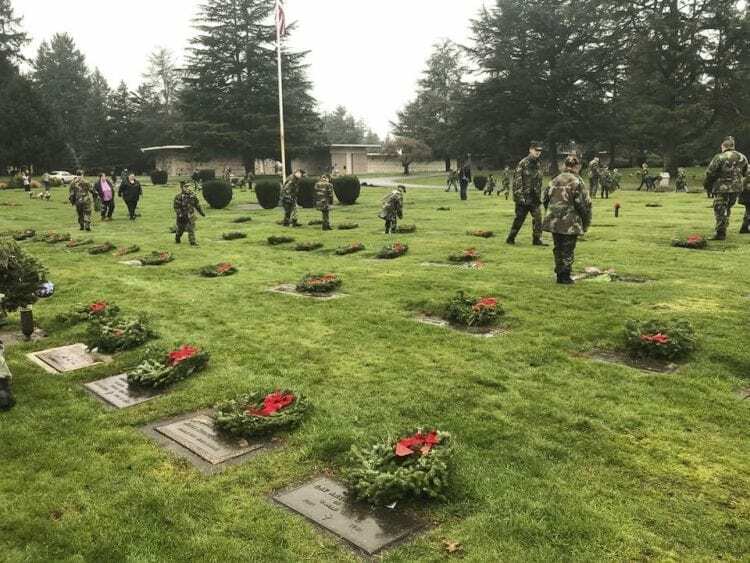 For members of the Lewis and Clark Young Marines, this included gathering to lay wreaths on veterans’ graves as part of the annual Wreaths Across America remembrance ceremony. 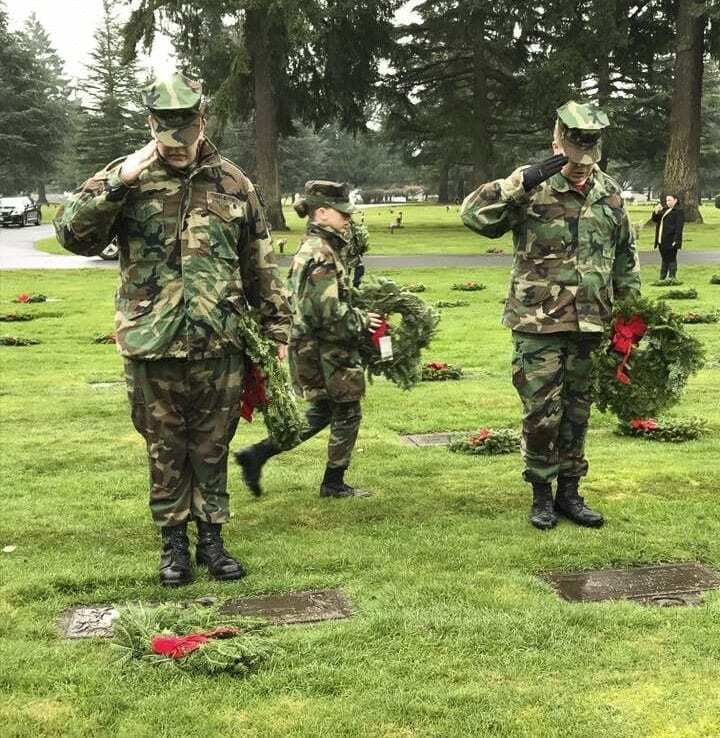 On Sat., Dec. 16, youth in the Lewis and Clark Young Marines gathered at the Evergreen Memorial Gardens for a ceremony honoring the sacrifices of veterans and to place wreaths on the graves of service members. The Wreaths Across America ceremony is a nationwide event that begins at 10 a.m. at Arlington National Cemetery, Young Marines Master Gunnery Sergeant Emma Langley explained. Langley was the youth coordinator for this year’s ceremony at Evergreen Memorial Gardens. 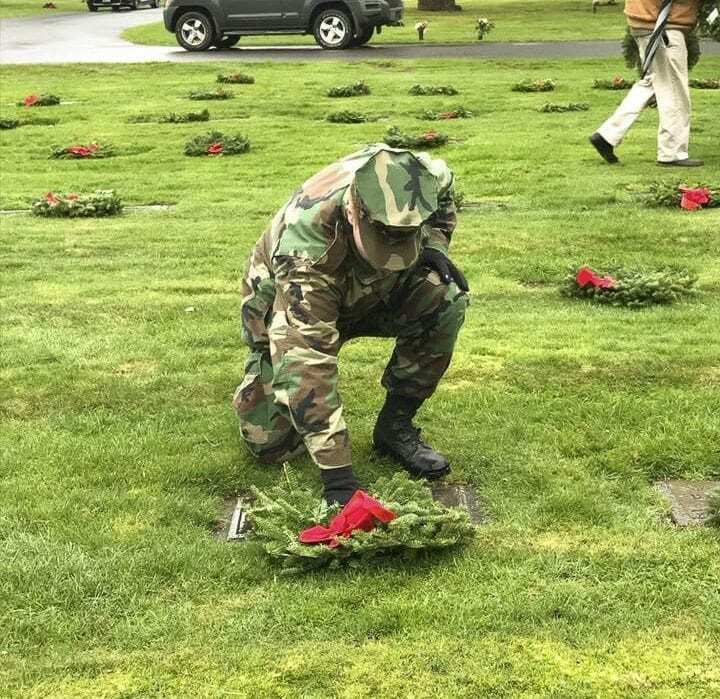 Across the country, hundreds of cemeteries follow the lead of Arlington and have wreath laying ceremonies at 10 a.m.
For the 2017 Wreaths Across America ceremony, 663 wreaths were sponsored for Evergreen Memorial Gardens, and of those, the Lewis and Clark Young Marines sold 461, according to Debbie Crawford, public affairs officer for the Lewis and Clark Young Marines. Prior to laying the wreaths in the cemetery, a ceremony was held in the Evergreen Memorial Gardens chapel. The ceremony included opening remarks by Devin Lewis, a Marine veteran and unit commander for the Lewis and Clark Young Marines. The ceremony was officiated by Young Marines Chaplain Steven Stanley and Young Marine Staff Sergeant Joshua Bambilla. A Young Marines color guard accompanied the opening ceremony. Representatives for each branch of the military as well as the Merchant Marine and POW/MIA were escorted by Young Marines and representatives from another organization. Each branch representative placed a ceremonial wreath at the front of the chapel, Crawford said. 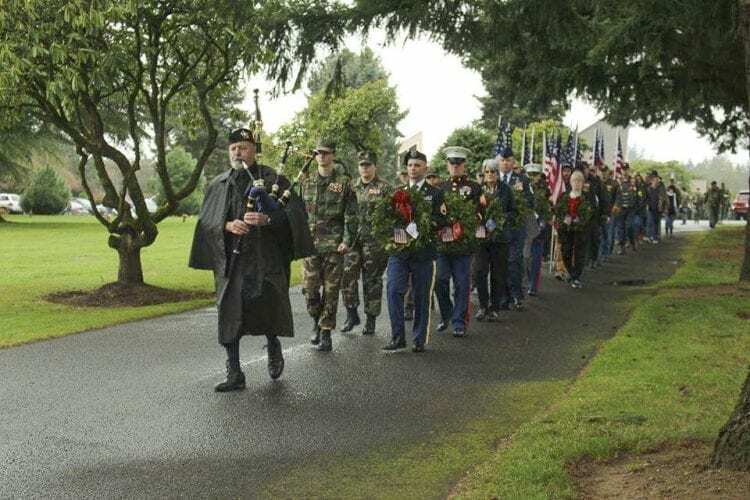 After the ceremony, a procession led by Portland Police Highland Guard member Garth Edwards, playing bagpipes, and the Patriot Guard Riders, proceeded out to the cemetery grounds, where members of the Young Marines began laying wreaths on graves. Crawford said that Vancouver Mayor-elect Anne McEnerny-Ogle laid the first wreath on the grave of Billy Butz. Butz was killed in action in 1950 and was listed as missing, until being recently identified and buried at Evergreen Memorial Gardens. 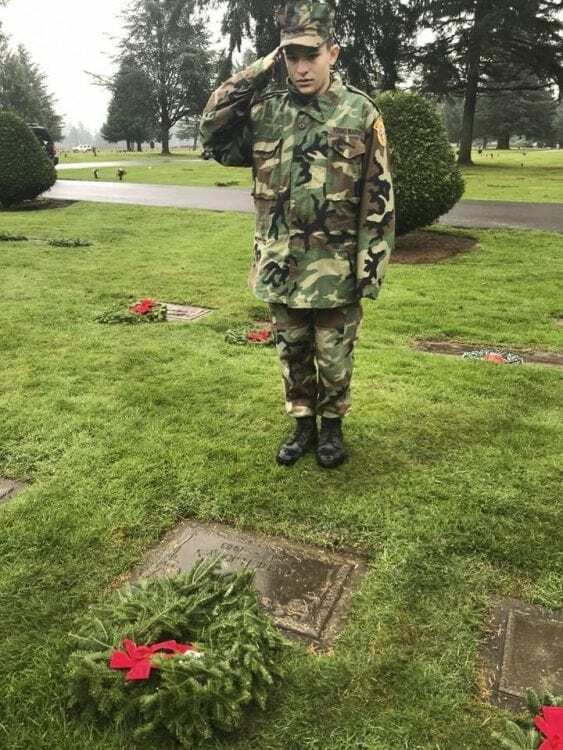 Each time a wreath was placed on a grave, the Young Marine placing it would read the name of the veteran and take a moment to stand and salute the grave, Crawford said. 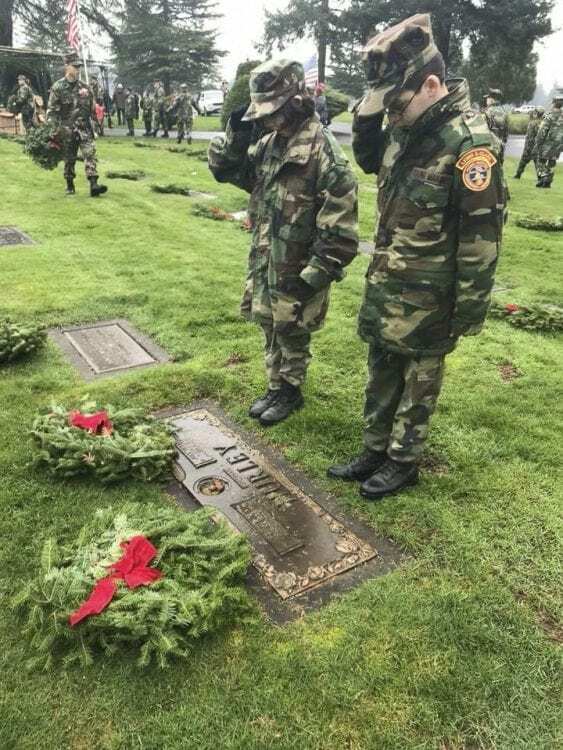 Members of the Lewis and Clark Young Marines said that the Wreaths Across America ceremony was an important time to remember and reflect on the sacrifices made by American servicemen and women for the freedoms American citizens enjoy. The Wreaths Across America Ceremony helps remind people of the fact that life in America is not “given, it’s very much paid for,” Langley said. Some of the wreaths were sponsored by family members that were unable to visit the graves of their relatives very often. Langley said that one veteran’s daughter lived in Alabama but sponsored a wreath for the Young Marines to lay on her mother’s grave. Young Marines Corporal Phillip Taylor shared a similar perspective. 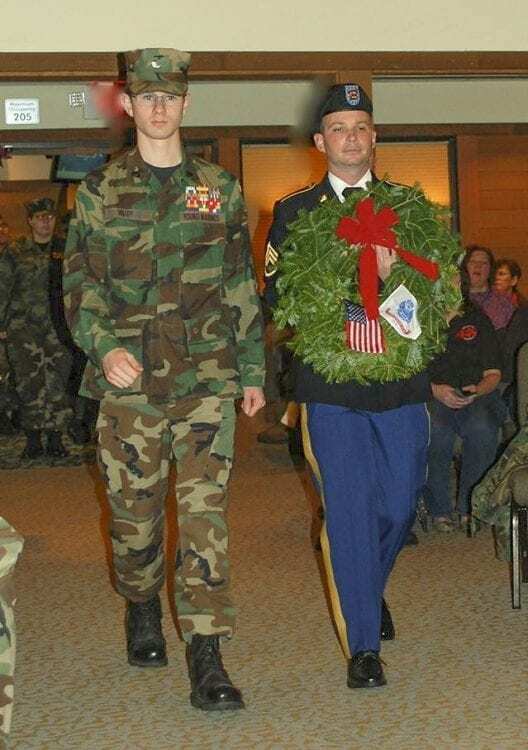 Remembrance and honor were guiding principles for the Young Marines who placed wreaths as part of the ceremony. “I just stood there taking a moment to remember them,” Young Marines Private First Class Gabriel Blok said. He said that laying the wreaths allowed him to pause to remember and thank the veterans for their service and sacrifice to the nation. Young Marines Private Chasity Cherrington agreed. “I feel honored to be there since they can’t be there and their family can’t be there at Christmas.” The Wreaths Across America ceremony meant that the veterans “still get holiday joy,” Cherrington said. Lewis said that the ceremony is not simply an annual event, but rather part of a continuing effort of remembrance year round. “We’re continuing to remember them,” Lewis said. The Lewis and Clark Young Marines is the local chapter of a national organization that helps kids ages 8 to 18 learn basic life skills and discipline, according to Patrick Vernier, an adult platoon leader with the Young Marines and a retired U.S. Army Staff Sergeant. Lewis said that the organization helps younger citizens understand the importance not only of remembering veterans, but what it means to be an American citizen, as well as why that is significant and why the sacrifices of others contribute to the freedoms Americans enjoy. The structure of the Young Marines is not intended to be a punitive method for straightening out troubled youth, but rather is intended to strengthen and enrich the lives of those that choose to participate, Lewis said. Crawford said that the Lewis and Clark Young Marines is currently reaching the end of their annual recruitment cycle. More information about the Lewis and Clark Young Marines can be found online at http://lcym.org/.